Since this year, Eid came in June, which is the hottest month of the year, therefore I decided to keep my outfit simple. 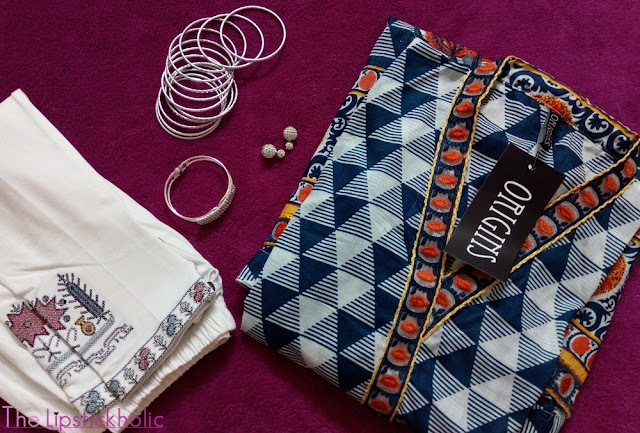 I opted for this chic ready-to-wear Kurti by Origins. Origins has surely become one of my favorite brands for ready-to wear clothing. 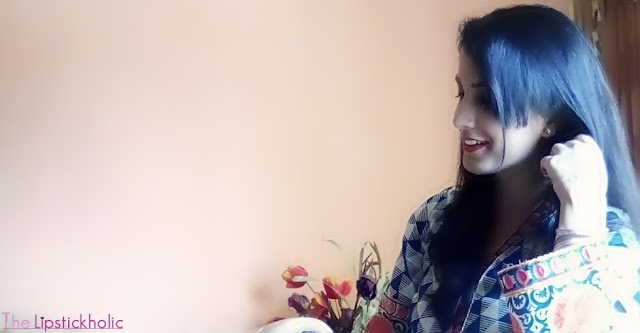 This blue and white, front open shirt with orange embroidery seemed perfect for summer Eid. It has long bell sleeves. The material of shirt was good like always and stitching was perfect too. I see myself wearing this shirt quite a lot with different pants/trousers as I love its design. 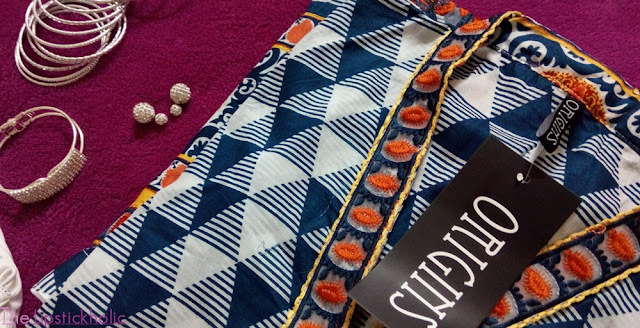 I paired the Kurti with white embroidered Khaadi tights. Now I know this year is all about gharara pants and loose trousers. However in such warm weather, I wanted to wear something comfortable therefore, these tights were what I decided to pair my loose shirt with. For shoes, I always prefer flats over heels for such occasions. So I wore really pretty blue flats by Stylo. 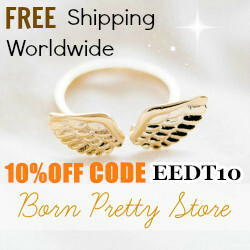 As for Makeup, it was a real challenge to look fresh all day long in such warm and humid weather. 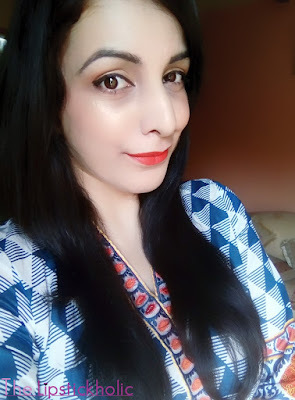 I decided to go for simple eyes, glowy cheeks and bright lips for this Eid. 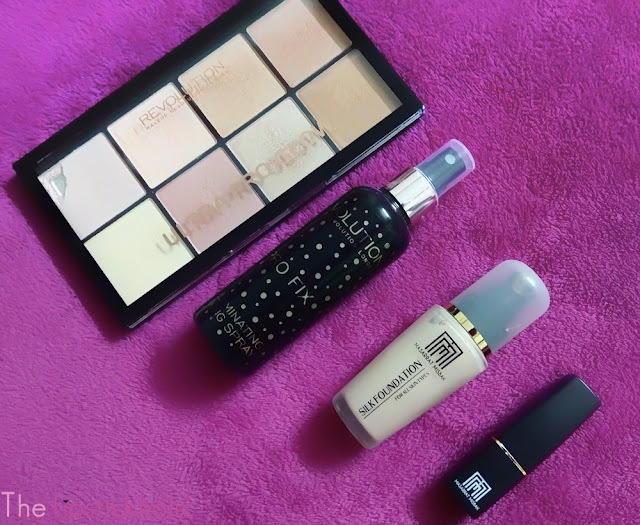 Few products that really helped me look gorgeous all day long on Eid-ul-Fitr 2017 are Makeup Revolution Ultra Pro Glow Palette, Makeup Revolution Pro Fix Illuminating Spray, Masarrat Misbah Makeup Silk Foundation and Masarrat Misbah Makeup Lip Varnish. Here is my makeup look for Eid-ul-Fitr 2017. 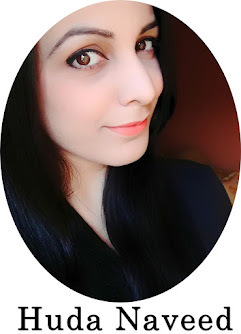 Masarrat Misbah Makeup Silk Foundation "Fair"
Sigma Beauty Eye Brow Duo "Dark"
Sigma Beauty Eye Shadow Palette "Nightlife"
Color Studio Kohl Addict Pencil "Brown"
L.A. 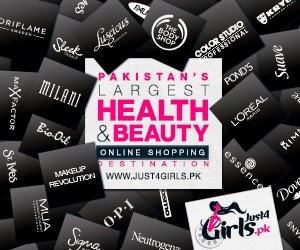 Girl Pro Conceal HD Concealer "Natural" and "Orange Corrector"
Freedom Makeup Blush Palette "Peach & Baked"
Makeup Revolution "Ultra Pro Glow Palette"
Makeup Revolution "Pro Fix Illuminating Spray"
MM Makeup Lip Varnish "MM Orange"
So this was my simple yet summer popping look for Eid-ul-Fitr 2017. Hope you like it. Thanks a lot dear. Good Day!